Is it possible to construct an Earthquake-proof building? Rapid violent shaking of the Earth’s surface caused by rapid movement of the Earth’s rocky outer layer is known as an Earthquake. Earthquakes occur when energy stored within the Earth, usually in the form of strain in rocks, is suddenly released. Elastic Rebound Theory lays down the phenomena that causes earthquakes. It is mostly related to slippage of active fault-lines in the earth’s crust. The motion along the fault is accompanied by the gradual buildup of elastic strain energy within the rock along the fault. The rock stores this strain energy like a giant spring being slowly tightened. Eventually, the strain along the fault exceeds the limit of the rocks at that point to store any additional strain. The fault then ruptures – that is, it suddenly moves a comparatively large distance comparatively short amount of time. The rocky masses which form the two sides of the fault then snap back into a new position. This snapping back into position, upon the release of strain, is the Elastic Rebound. The rupture of fault results in sudden release of the strain energy that has been built up over the years. Earthquakes are terrifying. 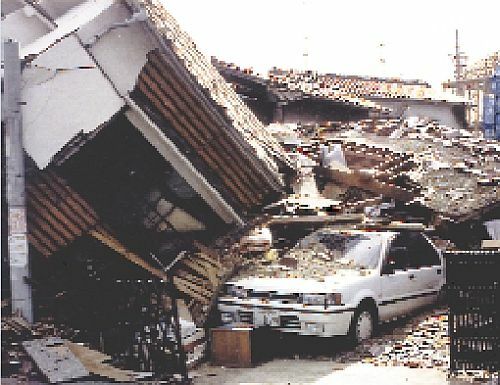 Horizontal and Vertical movement during earthquakes cause a lot of damage to buildings and infrastructure. So, Engineers and researchers have always tried to design Earthquake Resistant Structures to mitigate the damage and loss of life due to earthquakes. Buildings can be strengthened to a great extent, making it resistant to even very strong earthquakes. But there is a problem, as these techniques are subject to the law of diminishing returns. After a certain extent, it doesn’t make sense to make the structure stronger, unless you are developing critical infrastructure like Nuclear Power plants. But now a new invention could revolutionize the field of Earthquake Engineering. Japanese Researchers have developed a new super-alloy which has super-elastic ductility. Tohoku University researchers suggest that the alloy could help create quake-proof structures that can return to their original shape after the tremors have passed. This can be a potential breakthrough in the field of engineering and can help save lives.